01182013_Becherer_IraqMedical019: Doctors of War: Casualties of War: Global News Portfolio: New Orleans based Photojournalist covering the Deep South and beyond. 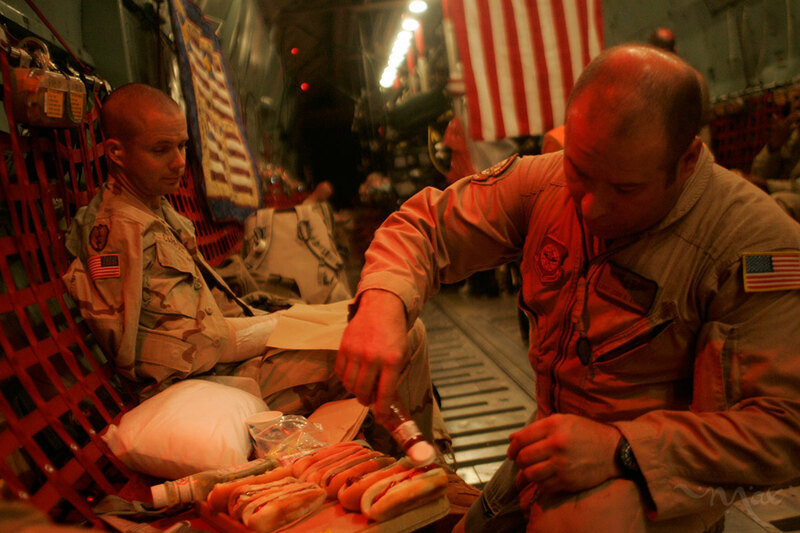 Flight medical technician, Staff Sergeant Judd Everly from the 94th Aeromedical Evacuation Squadron serves hot dogs to wounded soldier Staff Sergeant John Carroll, who has a broken hand, during the flight of a C-141 medical transport from Balad Air Base in central Iraq to Landstuhl Regional Medical Center in Germany where he will receive treatment. The flight medics try to make sure the wounded have all of their medical and comfort needs taken care of during the flight.